We’d love your help. Let us know what’s wrong with this preview of A Leaf In The Bitter Wind by Ting-xing Ye. One of the best ways to understand history is through eye-witness accounts. Ting-Xing Ye’s riveting first book, A Leaf in the Bitter Wind, is a memoir of growing up in Maoist China. It was an astonishing coming of age through the turbulent years of the Cultural Revolution (1966 - 1974). In the wave of revolutionary fervour, peasants neglected their crops, exacerbating the w One of the best ways to understand history is through eye-witness accounts. Ting-Xing Ye’s riveting first book, A Leaf in the Bitter Wind, is a memoir of growing up in Maoist China. It was an astonishing coming of age through the turbulent years of the Cultural Revolution (1966 - 1974). In the wave of revolutionary fervour, peasants neglected their crops, exacerbating the widespread hunger. While Ting-Xing was a young girl in Shanghai, her father’s rubber factory was expropriated by the state, and he was demoted to a labourer. A botched operation left him paralyzed from the waist down, and his health deteriorated rapidly since a capitalist’s well-being was not a priority. He died soon after, and then Ting-Xing watched her mother’s struggle with poverty end in stomach cancer. By the time she was thirteen, Ting-Xing Ye was an orphan, entrusted with her brothers and sisters to her Great-Aunt, and on welfare. Still, the Red Guards punished the children for being born into the capitalist class. Schools were being closed; suicide was rampant; factories were abandoned for ideology; distrust of friends and neighbours flourished. Ting-Xing was sent to work on a distant northern prison farm at sixteen, and survived six years of backbreaking labour and severe conditions. She was mentally tortured for weeks until she agreed to sign a false statement accusing friends of anti-state activities. Somehow finding the time to teach herself English, often by listening to the radio, she finally made it to Beijing University in 1974 as the Revolution was on the wane — though the acquisition of knowledge was still frowned upon as a bourgeois desire and study was discouraged. Readers have been stunned and moved by this simply narrated personal account of a 1984-style ideology-gone-mad, where any behaviour deemed to be bourgeois was persecuted with the ferocity and illogic of a witch trial, and where a change in politics could switch right to wrong in a moment. The story of both a nation and an individual, the book spans a heady 35 years of Ye’s life in China, until her eventual defection to Canada in 1987 — and the wonderful beginning of a romance with Canadian author William Bell. The book was published in 1997. The 1990s saw the publication of several memoirs by Chinese now settled in North America. Ye’s was not the first, yet earned a distinguished place as one of the most powerful, and the only such memoir written from Canada. It is the inspiring story of a woman refusing to “drift with the stream” and fighting her way through an impossible, unjust system. This compelling, heart-wrenching story has been published in Germany, Japan, the US, UK and Australia, where it went straight to #1 on the bestseller list and has been reprinted several times; Dutch, French and Turkish editions will appear in 2001. To ask other readers questions about A Leaf In The Bitter Wind, please sign up. A potential reader trying to assess the content of this memoir of almost four hundred pages by looking at its title, the portrait and back-cover summary would perhaps categorize it as a dreary tale of woe by an escapee from the chaotic social and political nightmare that comprised the Chinese Cultural Revolution. Yes, it is about that: a tale of horrendous suffering and deprivation, denial of justice and human compassion, a family torn apart by poverty and displacements enforced by the arbitrary decisions imposed by a dysfunctional autocracy. It is about how an ancient civilization ingrained with quaint superstitions and Confucian principles tries to adapt to new ways; but the rules are constantly changed in worshipful obedience to a dictatorial despot, Chairman Mao. But this is never a dreary tale. The author, whose familiar name is Ah Si, Number 4—designating her birth order—born in 1952, grows up in Shanghai not long after the Communist takeover in 1949. She loses her parents at a young age and becomes dependent on her unmarried aged Great-Aunt. She and her four siblings exist in poverty, trying to sustain themselves during famines, economic disruptions and social chaos. Because her father had been a factory owner she is labelled as belonging on the wrong side of the factional struggles. This is a shadow that hangs over her no matter how much she tries to overcome her hardships. She is sent away to work on a prison farm where conditions are inhumanely primitive and authority carries a big stick for anyone who fails to toe the line. But Ah Si is a survivor who against all odds eventually is placed in a position of influence as a translator and becomes a co-ordinator of receiving and entertaining foreign dignitaries. In the meantime she has married and become a mother. But curiously she has to accede to having a second male, who is infatuated with her husband, to be their constant companion. This is a well written book. It does not linger on setbacks and futility but moves on to take in the main events, the changes, the challenges, the twists of fate, the glimpses of hope that keep Ah Si struggling towards a better life. The book has the heart and spirit of an enduring optimism. The last third of the book provides absorbing reading towards what we know will be a well-deserved happy ending. Ting-Xing Ye's memoir is unbelievable, I couldn't put it down. The woman has led a life wrought with sadness and tragedies we can only read about in the lives of others. Ting-Xing is an amazingly strong woman, and a true survivor who deserves all the good the rest of her life can bring. "Spanning 35 years, this enthralling memoir chronicles the life of a survivor who has been buffeted by the winds of history. Ting-Xing Ye was born in Shanghai, the fourth child of a factory owner w Ting-Xing Ye's memoir is unbelievable, I couldn't put it down. The woman has led a life wrought with sadness and tragedies we can only read about in the lives of others. Ting-Xing is an amazingly strong woman, and a true survivor who deserves all the good the rest of her life can bring. "Spanning 35 years, this enthralling memoir chronicles the life of a survivor who has been buffeted by the winds of history. Ting-Xing Ye was born in Shanghai, the fourth child of a factory owner who had his factory taken from him. By the age of thirteen, her parents were dead. The Cultural Revolution then tore Ye's family apart. With grim irony, she offers a riveting account of her work on a prison farm, where, as the child of a "capitalist," she was subjected to humiliating psychological torture. Ye then wryly relates how she found herself accepted into Beijing University and assigned to the Foreign Ministry as a translator for the delegations of such dignitaries as Queen Elizabeth, Ronald Reagan and Imelda Marcos. In a moving and dramatic final section, Ye writes about her feudal-style marriage, her falling in love with a Canadian, and her eventual defection to Canada. Her former husband has refused her all access to her daughter. Now a Canadian citizen, Ye continues to attempt to contact her child, hoping to bring her to Canada where she too may be free. Well written memoir from the Cultural Revolution onwards. I read this at the same time as Jan Wong's "Red China Blues" and was interested to note the difference between the two books - one, Jan Wong's, about an idealistic Canadian choosing to come to China - and the other, this one, about a girl who had no choice but to suffer through the Cultural Revolution. The ending surprises me - especially when I realized who her husband was (having read his books as well). I don't think the narrative accur Well written memoir from the Cultural Revolution onwards. I read this at the same time as Jan Wong's "Red China Blues" and was interested to note the difference between the two books - one, Jan Wong's, about an idealistic Canadian choosing to come to China - and the other, this one, about a girl who had no choice but to suffer through the Cultural Revolution. There is much to learn about China during the cultural revolution in this memoir, and none of it good: a lot of difficult reality. [spoiler] Not having the author's experiences I cannot judge her, but the choice to leave her daughter is difficult for me as a reader to accept. I learned about Chinese culture, politics, and perspective from this book. It had a good plot at the same time. It is the memoir of a woman who lived through the Chinese cultural revolution. A memoir of the hardships the author endured living in China throughout Mao's cultural revolution. A heartbreaking and touching life told compellingly, I really enjoyed this book. I love biographies and autobiographies about women's lives. This one was harder to relate to because I couldn't remember the unfamiliar names, but still fascinating to have such an intimate glimpse of China. A leaf in the Bitter Wind is a memoir worth reading. It depicts the life of a young child who grows up during the Cultural Revolution. Ting-Xing Ye faced all of the hardships of a child born to a "capitalist" father. She is treated like dirt in her elementary school; When Xing Ye is sent to a prison farm as a young girl, she is terrorized and psychologically tortured by the superiors. Her crime throughout her young life is that is was born to a "capitalist." As the Cultural Revolution nears its A leaf in the Bitter Wind is a memoir worth reading. It depicts the life of a young child who grows up during the Cultural Revolution. Ting-Xing Ye faced all of the hardships of a child born to a "capitalist" father. She is treated like dirt in her elementary school; When Xing Ye is sent to a prison farm as a young girl, she is terrorized and psychologically tortured by the superiors. Her crime throughout her young life is that is was born to a "capitalist." As the Cultural Revolution nears its end, Xing Ye is accepted as a student at Beijing University. She becomes an English translator, a job that will change her life. She marries and has a little girl. Most of her money is given to her husband, and of course, the bank account is in his name only. It does not take long for Xing Ye's love for her husband to quickly ebb. (There are hints that her husband is gay with an old time friend who has become very much a part of their household from the moment Xing Ye and her husband were married, much to the dismay of Ying Ye). Ying Ye's life is filled with unhappiness in her marriage and is tired of her superiors at work who constantly look over her shoulder and criticize her for being kind to "foreigners." (Ironically, this IS her job). Xing Ye changes her life for the better, but the ending is bittersweet. 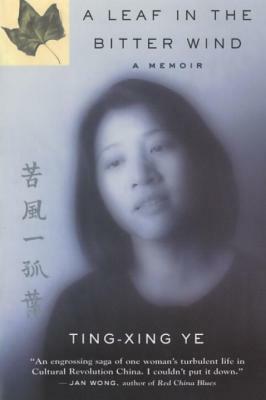 Ye Ting-Xing published two version but similar personal memoir of her early life in China. Although some info is incorrect, such as Hai Rui Removed From Office is by Wu Han not Hu Han. Some experiences is kind of fictional to me, such as caricatures of John F Kennedy. In 1960s, where and when did she see the caricature of JFK with Xs in China? I still like her memoir. I am curious about the answer to the questions in the EPILOGUE. Waiting for her third memoir about her life in Canada. This book is a memoir of the author's experiences during China's cultural revolution. Unfortunately, the writing doesn't go very much further beyond "this is what happened to me and it was really hard." Once I'd read the ending, I felt like the purpose of her book was to say, "My life was really hard, and that's why I decided to move in with my Canadian English teacher." Kind of a weird moral to the story. Reality stories are so much better than reality TV. This is a facinating memoir by a young woman who came of age during the Cultural Revolution in China. Her family history, inauspicious birth and cultural pressures make for a challenging life that includes time on a prison farm. Her intelligence and strong will enables her to maintain her sense of self and overcome these obstacles. This book provides an an interesting personal commentary on life in Communist China from the 60s through the 80s. I picked this one up at a thrift store and it was a great purchase for 25 cents! It is the autobiography of a woman who grew up in Maoist China, and gives a first hand look at what it was like when even the smallest misstep was made. The punishment was harsh on both the individual and their entire family. Excellent read. I did find her story of life during Mao's oppressive Cultural Revolution fascinating, but the personal side of her story left me wondering about some of her life choices. As a parent, I couldn't fathom making the same decisions. Also, it's strange not to have more details on her life in Canada included in the book. Often, I found myself yearning to hear other people's versions of events. Such an interesting read. I learned a lot about communist china during this time period. The author doesn't overwhelm with details but gives the reader a clear understanding of the political climate at the time. The author had a rough life of hard work, turmoil and strife. I liked it. A fascinating and heartbreaking memoir of a girl growing up in China during the Cultural Revolution. Her drive to educate herself despite spending years of her youth at a prison farm is nothing less than miraculous. Ah Si (4th child) was born in 1952, as Mao was coming to power. Very vivid description of life in China during this time. Ended up marrying William Bell (who died in 2016) and living in Canada. Fascinating book. My, my, where to even begin... I really felt for Ting-xing Ye all through reading this book. Her story will depress you but also inspire you, as you can see how strong it has made her. Highly recommended. I read this in high school. It was so interesting, having an inside view of the Cultural Revolution in China. The story was compelling. A good reason I liked memoirs was probably because of this. I couldn't put it down. Loved it. Amzing what people can survive. Also met the author. Wonderful woman. الرواية رااائعة لن أنساها ما حييت ..وتستمد روعتها من مونها قصة حقيقية تتجسد في رحلة كفاح امرأة ..رحلة طويلة تكللت بالنجاح نوعا ما والصمود الرائع . Astounded to find out what was actually happening in China when I was the same age. Typical of English-language scar literature genre, where the woman has a tough life in China, meets a foreigner, escapes to the West, then writes her memoir in English with his help. Learned so much. Must read for anyone who interacts with Chinese people - encourages understanding. A very moving personal account of living through the Cultural Revolution. She lives a couple of hours away from me now!!! I suppose it's because I'm not an avid reader of (auto)biographies, but this has a good plot and turned me into instant cultural revolution hater. A very good read - I learnt a lot about life in China at that time and how very hard it was! A personal story rather than a history book - so much more meaningful!